Sit back and enjoy this 50-minute soundscape piece, which will take you to Hejning, a city in Hasla. While this is not a documentary, it might as well be viewed in that way. Draw whatever comes to you on these screens where there is nothing to see. Sounds will guide you to Hejning. 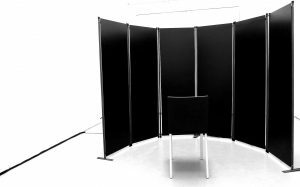 There are six black panels, creating a personal listening space. Attached at the back of each panel are two NTX exciters, which you can see from pictures below. Sound materials come from a variety of sources including Mnemon. All four sound installations at this exhibition (A Travel Log: From Fwarrheu to Hejning) are interrelated in terms of the sounds you hear and how they are presented.